Feb. 28, 2013 10:00 a.m.
Glen Zahara (Wetaskiwin Lions); Brenda Shantz (WCTS Vice-President); Mark McFaul (WCTS President); Cliff Reed (Lions President); Norm Rahbani (Lions); and Aren White (Lions). Thanks to the generous support of the Wetaskiwin Lions, another van identified as Unit #12 has been launched as part of the fleet of the Wetaskiwin Community Transportation Society. The Wetaskiwin Lions cheque for $11,500 enabled the Society to purchase a 2000 Chevrolet 3500 Cutaway handi-van from Jerry's Rocky Mountain Charters of Sundre. This brings the fleet up to total of 7 handi-vans that provide a service on-demand from 8:30 am to 5:00 pm Monday to Friday, a reduced service on Saturdays and church charters on Sundays. The donation by the Lions was timely. Unit #12 will reduce the use of Unit # 9 which is beginning to suffer from body wear and may not pass too many more Commercial Vehicle Inspections before it has to be retired. With the WCTS making in excess of 26,400 trips in 2012 (in 2009 it made 10,500) it is evident that demand for the service is strong and continues to build. Because of this, it is important that the WCTS maintain a sizable fleet so that rider demand can be met. In 2012, 147 out-of-town trips were made with 122 for medical and the remainder recreational purposes. In 2012 just under 110,000 km were logged in 8,300 hours of road time. Byron King, WCTS Manager explains the service. “The WCTS exists to provide specialized transportation service for seniors, special needs individuals, and those medically unable to drive (i.e. due to a broken leg) so that these people can continue to lead active, independent lives and to interact and contribute to the community. By doing so, this also enhances/maintains the physical and cognitive well-being of the clients. WCTS serves residents of Wetaskiwin as well as County residents living within the vicinity of the City”. 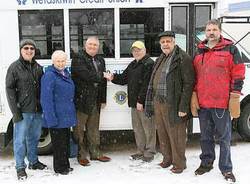 The Wetaskiwin transit system, like all transit services is heavily subsidized by grants and donations. Fare revenue generates just under half of the operating revenue and depending on the year, the balance of revenue is from annual grants from the City and County, handi-van sponsorship, partnership with the Central Alberta Persons with Developmental Disabilities, provincial grants, and other grants and fundraisers. While the WCTS receives subsidized funding from the City and the County and City and County reps sit on the WCTS Board and a City employee serves as the Transportation Coordinator, the WCTS is independent of the City/County and is a registered charity/not-for-profit. King states, “The term on-demand is meant to differentiate from traditional transit service where a predetermined route and schedule is presented to a rider. On-demand refers to the fact that a day's schedule and route are determined by bookings requested (in advance) by clients. Bookings are made by calling 780-312-7433 weekdays from 8:00 – 12:00 and 1:00 – 5:00 and 48 hours in advance of when you wish to ride”. A one-way per trip fare is $6 if paid by cash or $5 if a pre-paid punch card is purchased from either the WCTS office, the Hospital Gift Shop, Sobey's, Value Drug Mart, Touchstone Place Clubhouse, or Elite Audiotronic. The cost is even less if an in-town monthly weekday pass is purchased for $200. Any client is allowed to have 1 care-giver ride with them for free. Additional attendants must pay for their rides. In addition to in-town transportation Wetaskiwin Transit is also available for out-of-town charters (i.e. Edmonton or Red Deer) for either medical or recreational trips. President of the Wetaskiwin Lions, Cliff Reed talks about the donation. “As a club the Lions decided that the Handi-van Society benefits the community, is needed in the community and decided to support their fundraising efforts.” The Lions raise a great deal of their funds by operating the City owned campsite on the east edge of Wetaskiwin. The Lions have a long history of investing back into the community. Wetaskiwin Tax Increase… Will it Happen?